Home » Jennifer Garner and Her Girls Hit The Market! 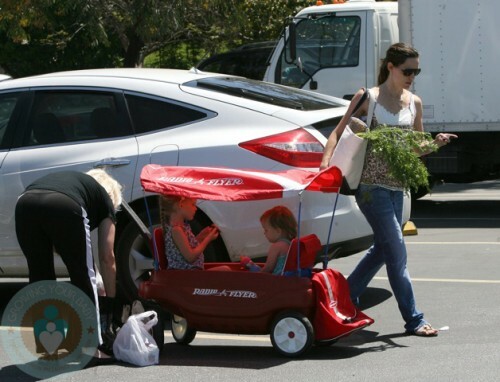 Down to earth momJennifer Garner was spotted with her girls over the weekend picking out some fresh fruit and veggies at the Santa Monica Farmer’s Market. Violet, 4, and Seraphina, 16 months, relaxed in an Radio Flyer Ultimate Comfort wagon while Jen ran around the market picking up everything she needed. A reliable insider at ABC tells them that there is talk of the network doing a “reboot” of one of the greatest TV series of all time, J.J. Abrams’ Alias. Could Sydney Bristow be coming back to the small screen? I guess only time will tell. Amanda Peet and Family Stroll in NYC!